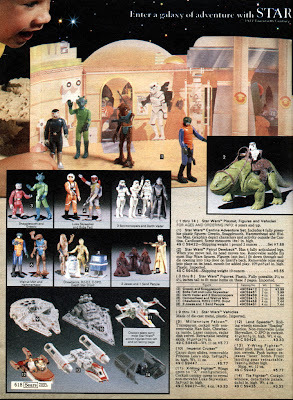 I stumbled on this great scan of the 1978 Sears Wish list catalog. I remember thumbing over these pages and ear marking the pages as a kid. Star Wars was released in May of 1977 and the toys hit stores soon after the release of the film that same year. In fact, the Cantina Adventure Set in the picture labeled 1, could be pre ordered before the toys came out. Well it seems that Hasbro made an error when desiging one of the characters. Snaggletooth, the tall blue character standing next to Greedo was actually in the movie as the one seen as item #3, the small red guy. The story goes like this. The toy designer only had an onscreen image from the movie to use as his template. He had no idea how tall ole' snaggletooth was so he designed him full size. This as it turns out was incorrect, snaggletooth was really only about 3 to 4 feet tall and thus Hasbro made a new sculpt to fix this problem. The cool thing to collectors, was the short release of the blue snaggletooth in the Cantina Adventure set. He only came in the set and as you could imagine, the set was soon fixed to include the small red one. The last time I looked the blue snaggletooth was commanding prices around $200 USD. I have one that I actually traded for because my friend didn't like him. I never did get the Cantina set, but I'm glad as hell, old Happy decided to make the trade. Anyway, it is a cool story. And, May the Force Be With You. Always.